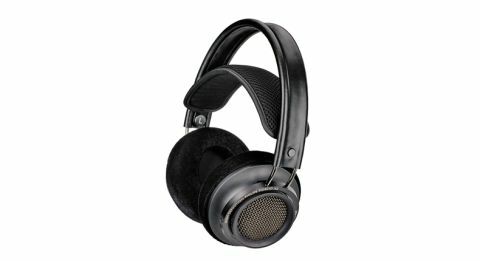 The Philips Fidelio X2s headphones have a big reputation to live up to. Their predecessors, the X1s, went straight to the leaderboard on their debut, however, superior-sounding cans from AKG and Grado have since cast a shadow on them. So, do the X2s have what it takes for Philips to steal the limelight back from its rivals? Philips has decided against going back to the drawing board for the winning formula, instead opting to tweak its existing model. The X2s have new drivers, which use the multi-layered diaphragm technology introduced in the brand’s S2 in-ears. This, it claims, gives more accurate bass response and a cleaner, more transparent treble. The jack is now 3.5mm too, though a 6.3mm adapter is included. The cosmetic changes aren’t drastic either, and taking after their beautiful, solidly built predecessors, the X2s feature mesh open-back ear cups; memory foam, velour-covered ear pads to die for; and a detachable (3m) cable and clip. The leather headband is as strong as ever and the familiar mesh band sits below for your comfort. The X2s are a classy all-black affair and in terms of build, comfort and looks, they sit at the top the sub-£300 heap. However, if you haven’t already guessed, these are not the type of headphones to use on-the-go. We’re glad (albeit not surprised) to hear the X1s’ spacious and smooth sound come has been preserved in the X2s, especially when it’s presented with extra dollops of detail, clarity and solidity. They tackle the demanding rhythmic pattern of Michael Jackson’s The Way You Make Me Feel with ease. Each note is punctual in the cohesive presentation and the drubbing bassline drives the track with aplomb. There’s bite to the proceedings too and dynamics are rendered with confidence. Vocals are full of feeling and cymbals wash over the top with precise detail. If anything, the balance is slightly bottom-heavy, but you can’t fault the X2s’ taut, tuneful and controlled quality. They don’t quite have the dynamic subtlety or transparency to trouble rivals such as the Grado SR325es, which launch themselves into the jaunty piano chords with more exuberance and attack. Still, the Philips Fidelio X2s are worthy alternatives. And if you’re looking for unrivalled comfort and an eye-pleasing design to boot, there’s none better.